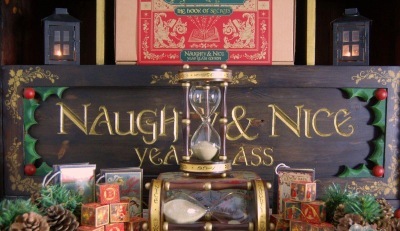 Experience the magic of Chrismas all year round with this enchanting naughty and nice year glass. And have the best behaved children ever! No child wants to be on the naughty list! Simply place the glass in a lying down position on a shelf. When your child does something naughty or nice turn the yearglass up on end accordingly for a few seconds so that the sand runs to the appropriate side. Return to the lying down position to monitor the naughty or nice balance. The Naughty and NIce Year Glass also makes a magical new baby or christening gift if you are looking for something a little different to give as a present. Something magial and special that can be passed down through the generations.